Cyril Smith provided this photo which he dates to around 1948. 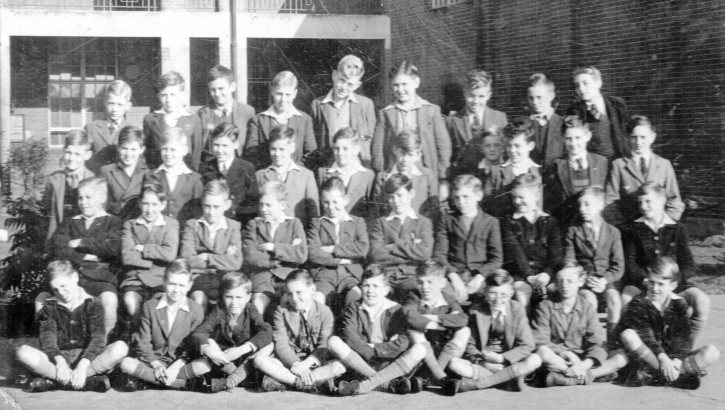 It shows a class of 39 boys on a sunny day, mostly with open neck shirts and grey flannel jackets or blazers. No long trousers. "Headmaster was Mr.E A Templar while I was at school, teacher was L S Sproston." Also see Cyril's memories from the late 1930s to the early 1950s. Pauline Grant, August 2013: “Mitch” Mitchell is my cousin and his name is Leslie Mitchell. He lived in Brook Road with his parents Anne and Harry Mitchell and his younger brother John. Unfortunately John died in 1994, Leslie is now in his seventies and lives in Middlesex. If you can help with other names please get in touch.